Wanderers' first ever trip to Deepdale to play Preston North End turned out to be a memorable one for the 1,200 or so Wycombe fans that made the journey north. 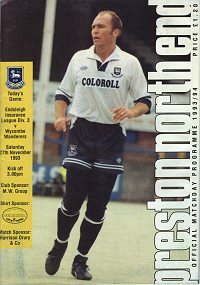 On an artifical surface and against a team managed by 'long-ball' merchant John Beck, Wycombe boss Martin O'Neill had to reshuffle his side following the absence of Dave Carroll due to flu - with Glyn Creaser given his Football League debut in the centre of defence and Matt Crossley moving to left back, while Duncan Horton shifted into midfield. A crowd of 9,265 warmed to a frantic game that saw Wanderers take the lead in the 28th minute when Terry Evans shot past Kelham O'Hanlon in the Preston goal. However, the home side equalised two minutes after the interval when Gareth Ainsworth sent a powerful header past Paul Hyde from Paul Raynor's cross. However, Wanderers restored their lead on 69 minutes - Steve Guppy crossing from the left where Keith Ryan's header was parried by Preston substitute 'keeper Steve Woods but only for Langford to convert at the near post. But once again the home side put on the pressure and grabbed another equaliser on 76 minutes when Greg Challender came through to convert Raynor's corner. Then with 90 minutes approaching it was left Wanderers' midfielder Hakan Hayrettin to steal the headlines when he sent in a bullet 40 yard drive that left Woods rooted to his goal-line - his only movement a quick glance to his side as the ball nestled in the back of the net. Seconds later the final whistle had gone and Wanderers had beaten the League leaders to finish the month in 4th place with 31 points from 17 games and still unbeaten away from home. Elsewhere that day, Aston Villa's defeat at Liverpool meant that Wanderers were the only side in English professional football with their unbeaten away record in the League that season still intact. Wycombe would travel to fifth placed Chester City on Saturday 11th December 1993 hoping to extend that record. Other post match news saw Wanderers Director Alan Parry come under the media spotlight for allegedly swearing at Preston fans during the game at Deepdale. John Baker, Secretary of the Preston Guild Club, made an official complaint to Wanderers following the game and the allegations made the national press. Parry denied the claims saying "This is a storm in a tea cup. It was what I regard as good-humoured banter. People say things to you and you reply in kind. No-one made any complaints to me during or after the game. It was banter." Two years previous, Parry escaped with a £100 fine from the FA after confronting referee Roy Osborne following a controversial home defeat to Macclesfield Town but no further action resulted from the incident at Preston. Hakan Hayrettin's earthshaking debut goal for Wycombe had more than a whiff of divine inspiration about it. Blues were hanging onto a point by their fingernails after Preston's late equaliser at Deepdale. But the bubbly central midfielder's perfect touch and timing shook the Division Three leaders to their very core. In a last-gasp attack in injury time, Hayrettin received the ball from Tim Langford narrowly beyond the halfway line. Other Blues players raced upfield to greet any possible return. But Hayrettin decided to go it alone and unleashed an unstoppable 40-yard cruise missile. Preston's substitute goalkeeper Steve Woods was left a study in waxwork, his only movement for a few seconds being a despairing glance at the ball firmly buried in the back of his net. Within a minute Manager Martin O'Neill O'Neill and the rest of Blues' dug-out team were racing across the plastic pitch to embrace the players and salute Wycombe's supporters. "When I hit it, I knew it was on target. It was brilliant." said Hayrettin, who has been disappointed with his lack of goals at Wycombe. Up to that point Wanderers had already endured a knife-edge confrontation in a cauldron of noise. Preston's 8,000-odd contingent in a 9,265 crowd bayed for Blues' blood against a backdrop of war rhythms drummed out by a band on one of the terraces. Close your eyes and it could have been the San Siro. Open them, though, and the action was starkly the opposite of the beautiful spectacle which graces Milan's soccer mecca every week. Preston proved no surprise, sticking rigidly and effectively to their long-ball-to-the-corner style in search of the set piece. Manager John Beck reportedly had QUALITY emblazoned on boards at all four corners of the ground at his former club Cambridge United - the boards being the target for his doctrine's quality pass. They were not present at Deepdale, but were there in spirit. Players, including left winger Paul Raynor and leading scorer Tony Ellis, displayed fearsome skill once reached. Raynor consistently dished out rapier-like crosses. Ellis left Glyn Creaser, playing his first League game due to flu-stricken Dave Carroll's absence, stumbling in his wake with one swift turn at the byline. But Blues were equal to their formidable task despite a reshuffle: Matt Crossley moving to left back, Creaser going into central defence and Duncan Horton slotting into midfield. Both sides matched each other blow for blow early on. Paul Hyde saved at pointblank range from David Moyes' header, then Hayrettin snapped back with a precursor to later glory with a long-range effort which forced a corner. Langford, whose pace suited the artificial surface, poached Blues' opener after Terry Evans flicked on Matt Crossley's throw on 28 minutes. The striker's swift turn and strike fooled Mike Conroy and gave Kelham O'Hanlon no chance. Raynor was unlucky not to have anyone at the far post to receive a 38th-minute cross which swerved in so viciously from the left that Hyde was in more danger than he initially appeared. It was the winger's corner which produced Preston's equaliser after the interval, Gareth Ainsworth exploiting gaps in the box to greet it with a powerful header. Blues' skipper Terry Evans came close to putting Wycombe back in the driving seat with a header just tipped over by O'Hanlon's half-time replacement Woods on 52 minutes. The action flowed from end to end, with Wycombe's attacks being of a more studied ilk than their opponents'. They restored their lead on 69 minutes. Tony Hemmings took the ball foward, then laid off to Steve Guppy who steamed inside from the left before crossing. Keith Ryan met his shot with a close range header which was parried by Woods, but only as far as Langford at the near post. The pressure pendulum had firmly swung Wycombe's way, but Preston underlined their reputation for saving or securing matches with late goals. So it seemed when Greg Challender raced in to convert Raynor's 76th-minute corner to draw level once more. The remaining minutes of normal time were nerve jangling. Then Hayrettin received his cue.